Is your workstation set up for best ergonomics? One thing that I always hear often is that standing all day is good for you. But in reality, similar to sitting down all day, prolonged standing could also be bad for you. There is no ergonomic benefits if you’re not moving. There are countless articles saying sitting is bad for you, but there are also articles on the web showing standing all day is bad for you as well. 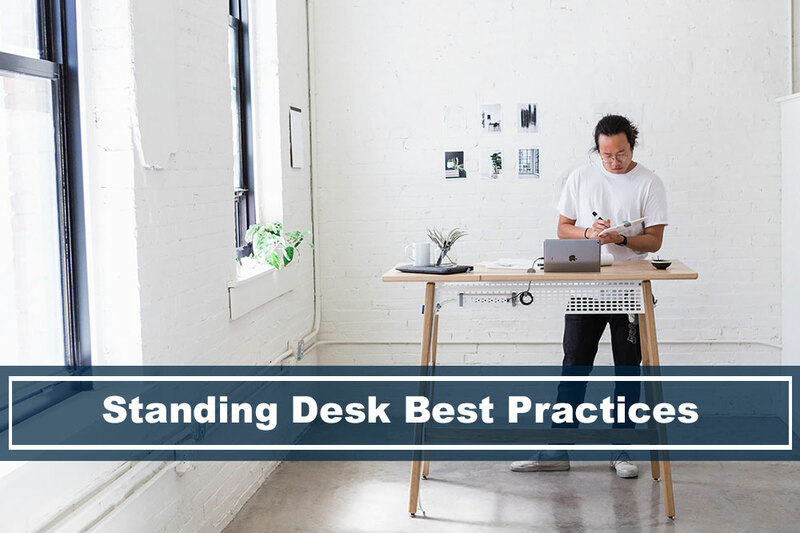 So to get to the sweet spot of actually having benefits from using a standing desk, you’ll need to understand some of the best practices of using the one. 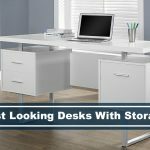 There’s a lot of standing desk converts on the market, some can be expensive, but if you’re looking for something more affordable, check out our list here. The ‘Safe’ Category: This is the lowest ergonomic risk of the three. It was determined that you can stand continuously for less than 1 hour AND for a maximum of 4 hours total throughout your day. The ‘Slightly Unsafe’ Category: The moderate ergonomic risk you can have. If you’re standing continuously for more than 1 hour OR more than 4 hours total throughout your day. The ‘Unsafe’ Category: The highest ergonomic risk. You’re standing continuously for more than 1 hour AND more than 4 hours total throughout your shift. 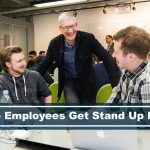 When compared to sit-stand desks, where you’re able to go between sitting and standing without sacrificing productivity, a standing-only desk would require more directness. If you have a desk that doesn’t convert from a standing to sitting, like one of these, then its one way to help with being in the ‘Safe’ zone, is to limit your standing to just 2 hours at a time, with 5 minutes of seated rest at every hour. This has been shown to be incredibly useful at reducing the ergonomic risk. The biggest thing to note is to make sure that you’re having breaks and there is large body movements. Don’t worry about the impact of productivity, because studies have shown that more frequent breaks actually improve productivity up to 10%. One of the easiest way to break into your standing workflow is to get the right equipment. 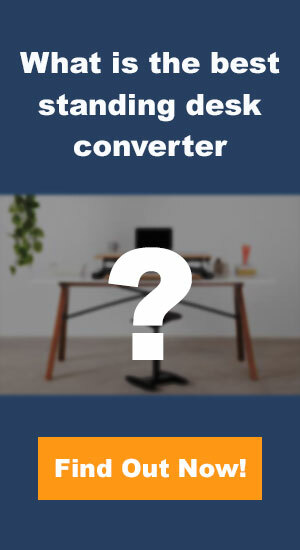 Finding a good sit to standing desk converter can help with posture and ergonomics. I believe that its imperative to finding one that matches your style and height. Some standing desks are more ergonomic than others, but not all are the same for everyone. One desk might be less ergonomic to one person, but more ergonomic to another. I suggest that you spend some time taking a look at the list. Anti-Fatigue Mats: These types of mats are engineered and designed to make your body naturally and imperceptibly sway, which encourages subtle movement by the calves and leg muscles. This helps blood flow in your legs and keeps the blood from stagnating in the veins – or causing you to feel fatigued. Studies have shown that foot discomfort is proportional to the amount of time standing. If you’re looking for good anti-fatigue mats, here’s a list we’ve put together. Perch Stools: These stools are the in-between sitting and standing. It helps you rest you’ve stood for too long. Researchers have shown that perch stools are a reasonable solution for reducing back discomfort from prolonged standing. Foot Rails: This equipment is placed under the desk and allows you to place one foot on the rail when you’re standing for long periods of time. The idea is to reduce the strain that accumulates on your lower back and lower extremities. The height should be approximately 6-inches from the ground. Standing Elbow Rest Height: The standing elbow rest height (SERH) is measured from grown to the underside of your forearm. The optimal position is that your keyboard and mouse should be slightly below your SERH to ensure that you’re relaxed and comfortable. Standing Resting Eye Height: This is by far the most important, yet it is often forgotten or neglected. If your monitor is not positioned where your eyes should be, then it cause a lot of discomfort to your neck, shoulders, and can often create headaches. The most optimal position of your monitor is to have the top of the monitor screen to be just slightly below your standing resting eye (SRE). Sometimes you might just need a monitor booster to get to the right height. The SRE is measured from the ground to your natural and comfortable eye position. When the monitor is slightly below the SRE, tilt the bottom of the screen upwards. In addition, make sure that your chin is parallel to the ground, and your eyes should be looking straight ahead. Understanding your posture: Sometimes we’re so used to our posture that we don’t really take a minute and look in the mirror to see if we have correct posture. To ensure that you have correct posture, make sure that your neck, torso, legs and head are all aligned and balanced. Roll your shoulders: When we’re so zoned into our work, we sometimes hunch over and slump our shoulders. This is inevitable. If you have a smartwatch or some kind of program that you can set your timer every so often, you can remind yourself to take a second and focus on your shoulders: Move your shoulders forward, up and then as far back as you can, do this 8-10 times every 45 mins to an hour. Take a quick walk: A simple 5 minute walk around the house or office is a great way to keep your body mobile.